BBC Weather have forecast a dramatic drop in temperatures for Monday as a cloud of freezing air prepares to engulf Britain from Europe. 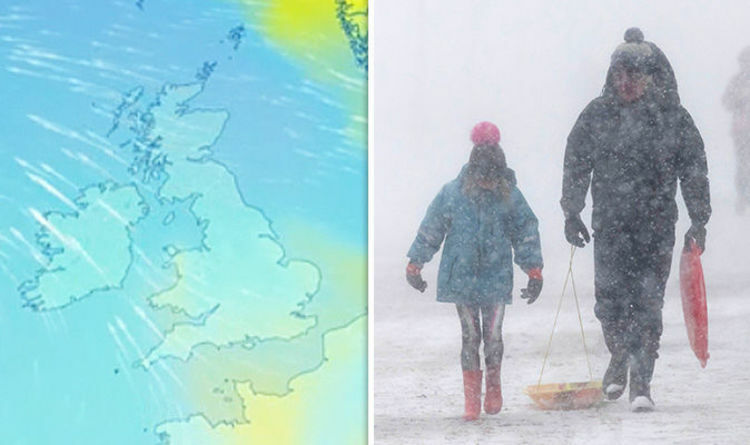 Forecasters have warned thermometers will start to plunge overnight on Sunday to progressively drop as the icy cloud moves over the country. Latest predictions also suggest the UK could experience the first wave of heavy snow on higher grounds, with the possibility of snowfalls moving lower as the week progresses. BBC Weather forecaster Matt Taylor said: "It’s going to get colder as high pressure moves up towards Scandinavia, the winds around it will bring even colder air our way into next week. "A bit more cloud around on Monday as well, we could actually see a lot more cloud. There’ll be some sunny spells in it out towards the west, there could be a few showers coming from that cloud in the east and temperatures at this stage down in single figures and it gets colder still into Tuesday." Mr Taylor continued: "Tuesday the wind picks up further, there’s more showers around mainly of rain but over the higher ground of England and Wales do not be surprised to see a few flakes of snow mixed in. "Sunshine possible but the wind will really exacerbate that colder feel. Temperatures for all in single figures, 6C or 7C on thermometers in England and Wales but, adding the windchill, is going to feel closer to freezing." The Met Office long-range forecast also warned the weather pattern barrelling in from Europe could result in "sleet or snow" toward the end of November. The Met Office said: "The remainder of November looks most likely to be characterised by winds blowing in from continental Europe across much of the country. This will bring variable and often large amounts of cloud, with the best of any sunshine in western areas. "There is also the likelihood of some showers, these most likely focussed across eastern areas, but perhaps becoming more widespread and persistent at times. With a relatively chilly air mass in place, there is scope for some sleet or snow, but this will most likely be restricted to higher ground." Sara Thornton, director of digital weather company Weathertrending, said: “Early in the week, showers will spread westwards across the North Sea on a cold and blustery wind. “These showers will fall mostly as rain, with any snow confined to the highest hills and mountains of the UK, such as the Highlands, the Pennines, the North York Moors and the Welsh Mountains. “From midweek onwards some more persistent wet weather may spiral our way as a vortex of low pressure arrives from the east. “Whilst this will mostly bring rain, we will monitor the possibility of it turning to wet snow at some lower levels.